← How Would Your Company Use a Cloud Storage Solution? Advertising has progressed with leaps and bounds since the digital world took over. In some cases it is extremely sad because print, radio and television adverts are losing their appeal, however in other cases it is most captivating. Interactive billboards are amongst the most captivating advertising mediums that it does not matter how young or old, where you come from or what you believe, you’re going to want to interact with one because the concepts of interactive billboards can be completely cool to play with. A Honda billboard in Dublin drew many curious onlookers thanks to its awesome concept whereby people could interact with the car on the poster. After texting the code to the relevant number, the car would start and smoke would be emitted from the exhausts while the lights would flicker and the engine would rev. 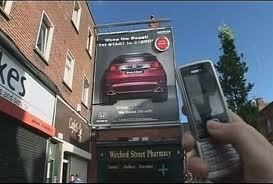 Now that is the coolest interactive billboard for boys who like expensive toys. Nikon had a completely epic concept when they decided to run a red carpet through a train station, up some stairs and straight into their store. Commuters who walked the red carpet were in for a treat when they walked past an interactive billboard that showed paparazzi with cameras clamouring to take photos of the person walking by. The interactive nature was that the cameras flashed and the commuter was treated to a minute in the life of a celebrity on a red carpet. They then followed the carpet all the way into the store where they could purchase one of the advertised cameras. Genius! What many consider to be one of the most effective interactive billboards to date was the billboard made-up by the Wisconsin Police Department. They cut-out board, which they set around digital counters. Each counter was attached to a specific concept line that would make the driver immediately slow down to consider that their current speed: Would set them on a 30% chance of crashing; Cost them $43,000 in medical bills if they had an accident; how much time they would spend in a hospital bed if the crash did not kill them. Mini personalized their interactive billboard. Each time a Mini Cooper drove by the billboard, based on personal information the driver had given on the questionnaire when buying their Mini, the board information would exhibit a personal greet the driver and show a comment based on the combination of their speed and occupation. Example: Neil, moving at the speed of justice (If Neil was an attorney). The concepts for interactive billboards are extreme in some cases and most exciting in others but there is definitely no arguing that without them advertising and office communication – thanks to embracing interactive screens – would not be where it is today. Vida Denning is a freelance writer who enjoys writing on a wide variety of topics. She came across the interactive billboards while searching for PA systems Chelmsford. As first an advertising copywriter, Vida does miss working on above the line advertising. This entry was posted in Advertisment, Technology and tagged ads, advertising, billboards, interactive, interactive billboards. Bookmark the permalink.